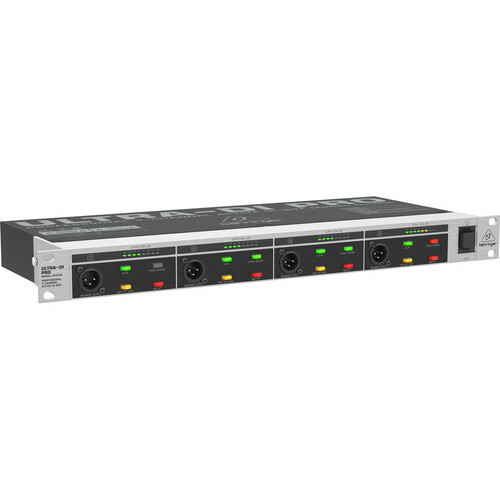 The ULTRA DI DI4000 provides four active direct box channels in a single rack space enclosure. Unlike a passive DI where the frequency response of the signal can be altered depending on the connected impedance, an active DI buffers the input signal with an amplifier. This assures that the sound source will reach the mixer balanced and noise-free. The input-buffering amplifier also ensures clean, pure and powerful sound when using extremely long cables. The ULTRA DI DI4000 features Behringer's OT-1 output transformer and the unit features a low pass filter and phase reverse and ground lift switches on every channel. Dimensions (WxDxH) 19" x 8" 1/2" x 1 3/4"
Box Dimensions (LxWxH) 20.8 x 12.1 x 4.3"
ULTRA-DI DI4000 Rackmount Direct Box is rated 4.5 out of 5 by 4. Rated 4 out of 5 by Lancelot from Fit for intended use Easy to install. Easy to use. Inconvenient layout (at least for my install). Outputs on front - inputs on back of a rack mounted unit. I would have preferred to have both on the back where I needed to make the connections in my rack. Rated 5 out of 5 by WE from GREAT VALUE! Does the work of 4 DI Boxs This is great, as it can take inputs from the guitars, amps and keyboards. Replaces 4 DI boxes. ALL at a very affordable price. Rated 4 out of 5 by Anonymous from Adequate and cost effective We use this to run laptop audio into a board for PA at large and small meetings. So far it's worked every time and doesn't add distortion or very much noise. So this is actually our second one. does it work on 220 volts? If it is the general export model, it will run on either 120 or 220 with no change. If it is not then you need to switch the voltage. The procedure to do this is described in the users manual. However I have never actually tried to hook mine up to 220.